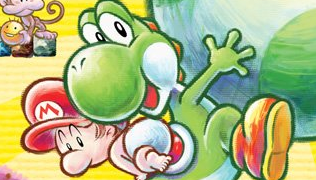 Yoshi resumes babysitting duties in Nintendo's egg-throwing adventure. Nintendo does an excellent job evolving its franchises, though to be fair, the Yoshi's Island games are more or less the same. Despite subtle differences, the core mechanics still involve transporting a baby (often Mario) across a 2D landscape, doing whatever you can to avoiding losing said little one. With this in mind, the series is at a crossroads. It appears the company does not want to mess with the formula its fans fell in love with in 1995. At the same time, how do you innovate on such a simple concept? This brings us to Yoshi's New Island for the 2DS and 3DS handhelds, a game that falls short of the incredible SNES original, but still manages to entertain. If you enjoy past Yoshi's Island games and crave more of the same platforming action, the latest entry delivers. Once again, you'll guide Yoshi through a plethora of attractive worlds filled with bad guys and collectibles with Baby Mario in tow. Take damage and he floats away, wailing uncontrollably until you recapture him. In addition, Yoshi fights back by devouring his enemies, whereupon which players have the option of transforming these presumably delicious treats into eggs Yoshi can then use as weapons. What separates this title from the rest are the Mega Eggdozers, giant eggs that destroy green pipes, ultimately revealing coins and other hidden items. This turns each stage into a scavenger hunt, as gamers track down each piece of loot. On top of that, Yoshi's New Island retains the attractive 2D graphics found in its predecessors, with the visuals giving each world a cool sketchbook appearance. Unless you intend to find those aforementioned collectibles, it won't take much effort to beat Yoshi's New Island (worlds speed by). The music doesn't necessarily capture our imaginations like the first entry in the series, and the awkward stages that utilize gyroscopic control feel unnecessary. Despite walking on familiar ground, Yoshi's New Island delivers a few hours of fun, though experienced players will feel like they've seen and done this all before.